Rupture of the rotator cuff tendon was first described by Smith in 1834. Subsequently, degenerative changes of the rotator cuff have been better characterized by Duplay (1872), Von Meyer (1924), Codman (1934), and Neer (1972). The exact mechanisms leading to the degeneration of the rotator cuff, however, are still being debated. Shoulder pain is the third most common cause of musculoskeletal disorders (MSDs), after low back and neck pain. Although rotator cuff tendinitis is considered a benign condition, a study of its long-term outcome found that 61% of patients were still symptomatic at 18 months, despite receiving what was considered sufficient conservative treatment, and 26% rated their symptoms as severe. MSDs are the primary disabling conditions of working adults. The prevalence of rotator cuff tendinitis has been found to be as high as 18% in certain workers who performed heavy manual labor. Webster and Snook estimated that the mean compensation cost per case of upper-extremity work-related MSD was $8070 in 1993; the total US compensable cost for upper extremity, work-related MSDs was $563 million in the 1993 workforce. The compensable cost is limited to the medical expenses and indemnity costs (lost wages). When other expenses (eg, full lost wages, lost production, cost of recruiting and training replacement workers, cost of rehabilitating the affected workers) are considered, the total cost to the national economy becomes much greater. The impact of rotator cuff disease on quality of life is even more difficult to assess than its cost. Further studies using valid methods that measure the impact of the disorder on general health (eg, the Medical Outcomes Study [MOS] 36-item short-form health survey [SF-36]) should help in the evaluation of this issue. 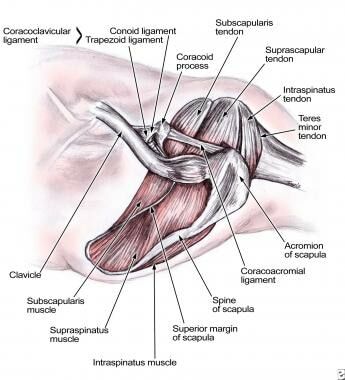 The rotator cuff is composed of four muscles—subscapularis, supraspinatus, infraspinatus, and teres minor—and their musculotendinous attachments (see the image below). The subscapularis is innervated by the subscapular nerve and originates on the scapula. It inserts on the lesser tuberosity of the humerus. The supraspinatus and the infraspinatus are both innervated by the suprascapular nerve, originate in the scapula, and insert on the greater tuberosity. The teres minor is innervated by the axillary nerve, originates on the scapula, and inserts on the greater tuberosity. A solid knowledge of the functional anatomy of the rotator cuff makes it easier to understand the disorder that affect this structure. The rotator cuff is the dynamic stabilizer of the glenohumeral joint; the static stabilizers are the capsule and the labrum complex, including the glenohumeral ligaments. Although the rotator cuff muscles generate torque, they also depress the humeral head. The deltoid abducts the shoulder. Without an intact rotator cuff, particularly during the first 60° of humeral elevation, the unopposed deltoid would cause cephalad migration of the humeral head, with resulting subacromial impingement. Rotator cuff tendinitis is the term used to describe irritation of tendons either from excessive pressure on the acromion or, less commonly, from intrinsic tendon pathology. Irritation of the adjacent bursa is known as subdeltoid or subacromial bursitis. Repetitive overhead activities resulting in irritation of tendons and bursae from repeated contact with the undersurface of the acromion is termed impingement syndrome. Rotator cuff dysfunction is typically a continuum of pathology ranging from tendinitis and bursitis to partial tearing to complete tearing in one or more of the tendons. Although the earlier stages may resolve with conservative care, actual tearing of the tendon can be more problematic. These tears most commonly occur at the tenoperiosteal (tendon-to-bone) junction. Because this area has a relatively poor blood supply, injury to the tendon at this location is very unlikely to heal well. Additionally, the constant resting tension in the muscle-tendon unit, or muscle tone, pulls any detached fibers away from the bone, preventing their reattachment. Finally, joint fluid from within the shoulder may seep into the gap created by the tear and prevent the normal healing processes from occurring. Shoulder pain is the third most common cause of MSDs, after low back pain and cervical pain. Estimates of the cumulative annual incidence of shoulder disorders range from 7% to 25% in the Western general population. The annual incidence is estimated at 10 cases per 1000 population, peaking at 25 cases per 1000 population in persons aged 42-46 years. In persons aged 70 years or older, 21% of persons have shoulder symptoms, most of which can be attributed to the rotator cuff. In cadaver studies, the rate of full-thickness tears ranges from 18% to 26%. The rate of partial-thickness tears ranges from 32% to 37% after age 40 years. Before age 40 years, tears are rare. In magnetic resonance imaging (MRI) studies, tears have been observed in 34% of asymptomatic individuals of any age. After age 60 years, 26% of patients have partial-thickness tears, and 28% demonstrate full-thickness tears. No known racial variation associated with rotator cuff disease is cited in the literature. In one study, a predominance of male patients (66%) seeking consultation for rotator disease was reported, but in other studies, the male-to-female ratio was 1:1. Rotator cuff disease is more common after age 40 years. The average age of onset is estimated at 55 years. An estimated 4% of cuff ruptures develop a cuff arthropathy. Various authors report the success rate of conservative treatment to be 33-90%, with longer recovery time required in older patients. Surgery results in better function regardless of the patient's age. Piasecki et al found that arthroscopic revision rotator cuff repair may be a reasonable option even after previous open repair, providing improved pain relief and shoulder function. In the 54 patients studied, the American Shoulder and Elbow Surgeons scores improved from 43.8 ± 5.7 to 68.1 ± 7.2, and the Simple Shoulder Test improved from 3.56 ± 0.8 to 7.5 ± 1.1. Visual Analog Scale (VAS) scores for pain improved from 5.17 ± 0.8 to 2.75 ± 0.8, and forward elevation increased from 121.0º ± 12.3º to 136º ± 11.8º. Female patients and those who had undergone more than one ipsilateral shoulder surgery had poorer results. In a systematic review of the published literature, Nho et al compared single-row (SR) with double-row (DR) suture anchor fixation in arthroscopic rotator cuff repair. They found no clinical differences between the two approaches. They concluded that the data in the published literature do not support the use of DR suture anchor fixation to improve clinical outcome, though they noted that there are some studies reporting that DR suture anchor fixation may improve tendon healing. A meta-analysis including three randomized controlled studies and two controlled clinical cohort studies compared outcomes between SR and DR rotator cuff repair. The results showed that whereas the DR technique significantly increased operating time, it provided greater external rotation, improved tendon healing, and decreased recurrence rate. However, there were no significant differences between the two techniques with regard to shoulder function, muscle strength, forward flexion, internal rotation, patient satisfaction, or return to work. One study analyzed the structural and functional outcomes after arthroscopic rotator cuff repair between SR, DR, and combined DR/suture-bridge techniques. After an average follow-up of 38.5 months, repair with the combined DR/suture-bridge technique resulted in an overall decreased retear rate, especially for large and massive tears. This combined technique proved to be an effective option for arthroscopic rotator cuff repair. Schofer et al, in a prospective, randomized, controlled study, compared high-energy extracorporeal shock-wave therapy (ESWT) with low-energy ESWT in the treatment of rotator cuff tendinopathy. Patients in the high-energy group received 6000 impulses of ED+ 0.78 mJ/mm2 in three sessions, and those in the low-energy group received 6000 impulses of ED+ 0.33 mJ/mm2. An increase in function and a reduction of pain were found in both groups. Although the improvement in Constant score was greater in the high-energy group, statistical analysis showed no significant difference between the two groups with respect to Constant score, pain reduction, and subjective improvement after 12 weeks and after 1-year follow-up. The T-scale, a measure of the anterolateral translation of the humeral head, has been suggested as a prognostic factor for rotator cuff repair. In a study of 120 consecutive patients with full-thickness rotator cuff tears, Taniguchi et al found that patients who had large-to-massive tears in conjunction with negative values on this scale had poorer clinical outcomes and were at greater risk for repeat tearing. They concluded that a negative T-scale value is a useful prognostic factor for considering reverse shoulder arthroplasty in patients with a higher risk of retear. Neer CS. Anterior acromioplasty for the chronic impingement syndrome in the shoulder. 1972. J Bone Joint Surg Am. 2005 Jun. 87(6):1399. [Medline]. Webster BS, Snook SH. The cost of compensable upper extremity cumulative trauma disorders. J Occup Med. 1994 Jul. 36(7):713-7. [Medline]. Bigliani LU, Morrison DS, April EW. The morphology of the acromion and its relationship to rotator cuff tears. Orthop Trans. 1986. 10:228. Wilson CL, Duff GL. Pathologic study of degeneration and rupture of the supraspinatus tendon. Arch Surg. 1943. 47:121. Uhthoff HK, Sano H. Pathology of failure of the rotator cuff tendon. Orthop Clin North Am. 1997 Jan. 28(1):31-41. [Medline]. Gerber C, Krushell RJ. Isolated rupture of the tendon of the subscapularis muscle. Clinical features in 16 cases. J Bone Joint Surg Br. 1991 May. 73(3):389-94. [Medline]. Sallay PI, Hunker PJ, Lim JK. Frequency of various tear patterns in full-thickness tears of the rotator cuff. Arthroscopy. 2007 Oct. 23(10):1052-9. [Medline]. Ward AD, Hamarneh G, Ashry R, Schweitzer ME. 3D shape analysis of the supraspinatus muscle: a clinical study of the relationship between shape and pathology. Acad Radiol. 2007 Oct. 14(10):1229-41. [Medline]. Via AG, De Cupis M, Spoliti M, Oliva F. Clinical and biological aspects of rotator cuff tears. Muscles Ligaments Tendons J. 2013 Apr. 3(2):70-9. [Medline]. [Full Text]. Piasecki DP, Verma NN, Nho SJ, Bhatia S, Boniquit N, Cole BJ, et al. Outcomes after arthroscopic revision rotator cuff repair. Am J Sports Med. 2010 Jan. 38(1):40-6. [Medline]. Nho SJ, Slabaugh MA, Seroyer ST, Grumet RC, Wilson JB, Verma NN, et al. Does the literature support double-row suture anchor fixation for arthroscopic rotator cuff repair? A systematic review comparing double-row and single-row suture anchor configuration. Arthroscopy. 2009 Nov. 25(11):1319-28. [Medline]. Prasathaporn N, Kuptniratsaikul S, Kongrukgreatiyos K. Single-row repair versus double-row repair of full-thickness rotator cuff tears. Arthroscopy. 2011 Jul. 27(7):978-85. [Medline]. Mihata T, Watanabe C, Fukunishi K, et al. Functional and structural outcomes of single-row versus double-row versus combined double-row and suture-bridge repair for rotator cuff tears. Am J Sports Med. 2011 Oct. 39(10):2091-8. [Medline]. Schofer MD, Hinrichs F, Peterlein CD, Arendt M, Schmitt J. High- versus low-energy extracorporeal shock wave therapy of rotator cuff tendinopathy: a prospective, randomised, controlled study. Acta Orthop Belg. 2009 Aug. 75(4):452-8. [Medline]. Drake GN, O'Connor DP, Edwards TB. Indications for reverse total shoulder arthroplasty in rotator cuff disease. Clin Orthop Relat Res. 2010 Jun. 468 (6):1526-33. [Medline]. Wellmann M, Struck M, Pastor MF, Gettmann A, Windhagen H, Smith T. Short and midterm results of reverse shoulder arthroplasty according to the preoperative etiology. Arch Orthop Trauma Surg. 2013 Apr. 133(4):463-71. [Medline]. Oh JH, Kim SH, Shin SH, et al. Outcome of rotator cuff repair in large-to-massive tear with pseudoparalysis: a comparative study with propensity score matching. Am J Sports Med. 2011 Jul. 39(7):1413-20. [Medline]. Chung SW, Oh JH, Gong HS, Kim JY, Kim SH. Factors affecting rotator cuff healing after arthroscopic repair: osteoporosis as one of the independent risk factors. Am J Sports Med. 2011 Oct. 39(10):2099-107. [Medline]. Taniguchi N, D'Lima DD, Suenaga N, Chosa E. A new scale measuring translation of the humeral head as a prognostic factor for the treatment of large and massive rotator cuff tears. J Shoulder Elbow Surg. 2018 Feb. 27 (2):196-203. [Medline]. Valadie AL 3rd, Jobe CM, Pink MM, et al. Anatomy of provocative tests for impingement syndrome of the shoulder. J Shoulder Elbow Surg. 2000 Jan-Feb. 9(1):36-46. [Medline]. de Jesus JO, Parker L, Frangos AJ, Nazarian LN. Accuracy of MRI, MR arthrography, and ultrasound in the diagnosis of rotator cuff tears: a meta-analysis. AJR Am J Roentgenol. 2009 Jun. 192(6):1701-7. [Medline]. Palmer WE, Brown JH, Rosenthal DI. Rotator cuff: evaluation with fat-suppressed MR arthrography. Radiology. 1993 Sep. 188(3):683-7. [Medline]. Kluger R, Mayrhofer R, Kröner A, Pabinger C, Pärtan G, Hruby W, et al. Sonographic versus magnetic resonance arthrographic evaluation of full-thickness rotator cuff tears in millimeters. J Shoulder Elbow Surg. 2003 Mar-Apr. 12(2):110-6. [Medline]. Waldt S, Bruegel M, Mueller D, Holzapfel K, Imhoff AB, Rummeny EJ. Rotator cuff tears: assessment with MR arthrography in 275 patients with arthroscopic correlation. Eur Radiol. 2007 Feb. 17(2):491-8. [Medline]. Toyoda H, Ito Y, Tomo H, Nakao Y, Koike T, Takaoka K. Evaluation of rotator cuff tears with magnetic resonance arthrography. Clin Orthop Relat Res. 2005 Oct. 439:109-15. [Medline]. Kim HA, Kim SH, Seo YI. Ultrasonographic findings of painful shoulders and correlation between physical examination and ultrasonographic rotator cuff tear. Mod Rheumatol. 2007. 17(3):213-9. [Medline]. Teefey SA, Petersen B, Prather H. Shoulder Ultrasound vs MRI for rotator cuff pathology. PM R. 2009 May. 1 (5):490-5. [Medline]. Bakalim G, Pasila M. Surgical treatment of rupture of the rotator cuff tendon. Acta Orthop Scand. 1975 Nov. 46(5):751-7. [Medline]. Björkenheim JM, Paavolainen P, Ahovuo J, Slätis P. Surgical repair of the rotator cuff and surrounding tissues. Factors influencing the results. Clin Orthop Relat Res. 1988 Nov. 148-53. [Medline]. DeFranco MJ, Derwin K, Iannotti JP. New therapies in tendon reconstruction. J Am Acad Orthop Surg. 2004 Sep-Oct. 12(5):298-304. [Medline]. [Full Text]. Levine WN, Bigliani LU. Shoulder impingement and rotator cuff disease: A strategy of management options. Chan KM, Fu FH, Maffulli N, et al, eds. Controversies in Orthopaedic Sports Medicine. Baltimore: Williams & Wilkins; 1997. Wirth MA, Basamania C, Rockwood CA Jr. Nonoperative management of full-thickness tears of the rotator cuff. Orthop Clin North Am. 1997 Jan. 28(1):59-67. [Medline]. Zingg PO, Jost B, Sukthankar A, Buhler M, Pfirrmann CW, Gerber C. Clinical and structural outcomes of nonoperative management of massive rotator cuff tears. J Bone Joint Surg Am. 2007 Sep. 89(9):1928-34. [Medline]. Arce G, Bak K, Bain G, Calvo E, Ejnisman B, Di Giacomo G, et al. Management of disorders of the rotator cuff: proceedings of the ISAKOS upper extremity committee consensus meeting. Arthroscopy. 2013 Nov. 29 (11):1840-50. [Medline]. Sambandam SN, Khanna V, Gul A, Mounasamy V. Rotator cuff tears: An evidence based approach. World J Orthop. 2015 Dec 18. 6 (11):902-18. [Medline]. [Full Text]. Ebenbichler GR, Erdogmus CB, Resch KL, Funovics MA, Kainberger F, Barisani G. Ultrasound therapy for calcific tendinitis of the shoulder. N Engl J Med. 1999 May 20. 340(20):1533-8. [Medline]. Ebenbichler GR, Resch KL, Graninger WB. Resolution of calcium deposits after therapeutic ultrasound of the shoulder. J Rheumatol. 1997 Jan. 24(1):235-6. [Medline]. Daecke W, Kusnierczak D, Loew M. [Extracorporeal shockwave therapy (ESWT) in tendinosis calcarea of the rotator cuff. Long-term results and efficacy]. Orthopade. 2002 Jul. 31(7):645-51. [Medline]. Maier M, Tischer T, Anetzberger H, Gerdesmeyer L, Pellengahr C, Schulz CU. [Mineral analysis of roentgenologically defined calcifications in patients with chronic calcifying tendinitis of the rotator cuff]. Z Orthop Ihre Grenzgeb. 2002 Jul-Aug. 140(4):399-403. [Medline]. Sabeti-Aschraf M, Dorotka R, Goll A, Trieb K. Extracorporeal shock wave therapy in the treatment of calcific tendinitis of the rotator cuff. Am J Sports Med. 2005 Sep. 33(9):1365-8. [Medline]. Moretti B, Garofalo R, Genco S, Patella V, Mouhsine E. Medium-energy shock wave therapy in the treatment of rotator cuff calcifying tendinitis. Knee Surg Sports Traumatol Arthrosc. 2005 Jul. 13(5):405-10. [Medline]. Buchbinder R, Green S, Youd JM. Corticosteroid injections for shoulder pain. Cochrane Database Syst Rev. 2003. (1):CD004016. [Medline]. van der Heijden GJ. Shoulder disorders: a state-of-the-art review. Baillieres Best Pract Res Clin Rheumatol. 1999 Jun. 13(2):287-309. [Medline]. Goupille P, Sibilia J. Local corticosteroid injections in the treatment of rotator cuff tendinitis (except for frozen shoulder and calcific tendinitis). Groupe Rhumatologique Français de l'Epaule (G.R.E.P.). Clin Exp Rheumatol. 1996 Sep-Oct. 14(5):561-6. [Medline]. van der Heijden GJ, van der Windt DA, de Winter AF. Physiotherapy for patients with soft tissue shoulder disorders: a systematic review of randomised clinical trials. BMJ. 1997 Jul 5. 315(7099):25-30. [Medline]. [Full Text]. Blair B, Rokito AS, Cuomo F, et al. Efficacy of injections of corticosteroids for subacromial impingement syndrome. J Bone Joint Surg Am. 1996 Nov. 78(11):1685-9. [Medline]. Dahan TH, Fortin L, Pelletier M, et al. Double blind randomized clinical trial examining the efficacy of bupivacaine suprascapular nerve blocks in frozen shoulder. J Rheumatol. 2000 Jun. 27(6):1464-9. [Medline]. Romeo AA, Hang DW, Bach BR Jr, Shott S. Repair of full thickness rotator cuff tears. Gender, age, and other factors affecting outcome. Clin Orthop Relat Res. 1999 Oct. 243-55. [Medline]. Baysal D, Balyk R, Otto D, et al. Functional outcome and health-related quality of life after surgical repair of full-thickness rotator cuff tear using a mini-open technique. Am J Sports Med. 2005 Sep. 33(9):1346-55. [Medline]. Burkhart SS, Danaceau SM, Pearce CE Jr. Arthroscopic rotator cuff repair: Analysis of results by tear size and by repair technique-margin convergence versus direct tendon-to-bone repair. Arthroscopy. 2001 Nov-Dec. 17(9):905-12. [Medline]. Roye RP, Grana WA, Yates CK. Arthroscopic subacromial decompression: two- to seven-year follow-up. Arthroscopy. 1995 Jun. 11(3):301-6. [Medline]. Nassos JT, Chudik SC. Arthroscopic rotator cuff repair with biceps tendon augmentation. Am J Orthop (Belle Mead NJ). 2009 Jun. 38(6):279-81. [Medline]. Chiang ER, Ma HL, Wang ST, Hung SC, Chen TH. Arthroscopic treatment for pigmented villonodular synovitis of the shoulder associated with massive rotator cuff tear. Arthroscopy. 2009 Jul. 25(7):716-21. [Medline]. Pauly S, Scheibel M. [Arthroscopic rotator cuff surgery : New and established methods]. Orthopade. 2018 Jan 19. [Medline]. MacDonald P, McRae S, Leiter J, Mascarenhas R, Lapner P. Arthroscopic rotator cuff repair with and without acromioplasty in the treatment of full-thickness rotator cuff tears: a multicenter, randomized controlled trial. J Bone Joint Surg Am. 2011 Nov 2. 93 (21):1953-60. [Medline]. Castricini R, Longo UG, De Benedetto M, Panfoli N, Pirani P, Zini R, et al. Platelet-rich plasma augmentation for arthroscopic rotator cuff repair: a randomized controlled trial. Am J Sports Med. 2011 Feb. 39(2):258-65. [Medline]. Wall KC, Toth AP, Garrigues GE. How to Use a Graft in Irreparable Rotator Cuff Tears: A Literature Review Update of Interposition and Superior Capsule Reconstruction Techniques. Curr Rev Musculoskelet Med. 2018 Jan 11. [Medline]. Sethi P, Franco WG. The Role of Superior Capsule Reconstruction in Rotator Cuff Tears. Orthop Clin North Am. 2018 Jan. 49 (1):93-101. [Medline]. Schlegel TF, Abrams JS, Bushnell BD, Brock JL, Ho CP. Radiologic and clinical evaluation of a bioabsorbable collagen implant to treat partial-thickness tears: a prospective multicenter study. J Shoulder Elbow Surg. 2018 Feb. 27 (2):242-251. [Medline]. Series of events. Courtesy of Dr Thomas Murray, Orthopaedic Associates of Portland. A tear in the supraspinatus tendon. Courtesy of Dr Thomas Murray, Orthopaedic Associates of Portland. In this patient's shoulder radiography, the humeral head no longer matches up with the glenoid because the rotator cuff is torn and the strong deltoid muscle is pulling the head superiorly toward the acromion. Courtesy of Dr Thomas Murray, Orthopaedic Associates of Portland. View of large tear from posterior (behind). Socket is to the right. Courtesy of Dr Thomas Murray, Orthopaedic Associates of Portland. Visualizing torn rotator cuff from within the joint. The biceps tendon is running vertically on the left. Courtesy of Dr Thomas Murray, Orthopaedic Associates of Portland. Motorized burr removing under-surface of acromion. Courtesy of Dr Thomas Murray, Orthopaedic Associates of Portland. View of large tear from the "50 yard line." Courtesy of Dr Thomas Murray, Orthopaedic Associates of Portland. The side-to-side stitches begin to close the large tear defect. Courtesy of Dr Thomas Murray, Orthopaedic Associates of Portland. An arthroscopic knot-tying instrument is used to pass tie knots in the suture to secure the repair. Courtesy of Dr Thomas Murray, Orthopaedic Associates of Portland. Small metallic anchors (5 mm) with sutures attached are then inserted into the humerus at the site desired for tendon reattachment. The anchors are recessed below the surface, so only the suture is visible. Courtesy of Dr Thomas Murray, Orthopaedic Associates of Portland. Sutures are anchored with the metallic anchors. Courtesy of Dr Thomas Murray, Orthopaedic Associates of Portland. Normal double-contrast arthrography. Courtesy of Dr Thomas Murray, Orthopaedic Associates of Portland. This image depicts the channel between the articular capsule and the subacromial-subdeltoid bursa in a complete rotator cuff tear. Courtesy of Dr Thomas Murray, Orthopaedic Associates of Portland. Even if the channel cannot be always identified, the presence of contrast medium in the subdeltoid-subacromial bursa signals the presence of a complete rotator cuff tear. Courtesy of Dr Thomas Murray, Orthopaedic Associates of Portland. CT-arthrography of the shoulder in the axial plane. Note the presence of air and contrast in the subacromial-subdeltoid bursa. Courtesy of Dr Thomas Murray, Orthopaedic Associates of Portland. Full-thickness tear of the supraspinatus as seen as a hyperintensity line through the full thickness of the tendon in a flash 2-dimensional MRI sequence in coronal oblique plane. Courtesy of Dr Thomas Murray, Orthopaedic Associates of Portland. Slight hyperintensity signal within the tendon without trans-sectional hyperintensity throughout the tendon is compatible with tendinopathy without complete tear. Additionally, note the presence of the hyperintensity signal in the region of the subdeltoid-subacromial bursa, which indicates bursitis. Courtesy of Dr Thomas Murray, Orthopaedic Associates of Portland. Calcifications are seen as hypointense foci in flash 2-dimensional images. Courtesy of Dr Thomas Murray, Orthopaedic Associates of Portland. MRI arthrography can help to identify labral tears, as seen in this image. The contrast medium penetrates between the labrum and the articular surface. Courtesy of Dr Thomas Murray, Orthopaedic Associates of Portland. Ultrasound is another modality to demonstrate a complete rotator cuff tear, as seen here with a gap of more than 2 cm between both extremities of the torn tendon. Courtesy of Dr Thomas Murray, Orthopaedic Associates of Portland.